This post is part of a continuing series dedicated to the questions that surround Industry 4.0, the Industrial Internet, and manufacturing. There are questions – lots of them – around Industry 4.0. So many, it seems, that Canadian manufacturers are still skeptical of its value. To shed some light on this confusing subject, I invited three industry experts to join me in answering some of the most common questions about Industry 4.0. Matt Rendall, CEO, OTTO Motors: In the last decade, massive technology pillars have been in development like cloud computing, big data, and mobile computing. It’s these types of pillars that have enabled the Industry 4.0 movement and, in turn, will allow the vision of the smart factory to become reality. Industry 4.0 is the next industrial revolutionthat represents the connectivity between industrial equipment and constant data flow to access and analyze centralized information. As industry is beginning to leverage these capabilities, we’re now able to capitalize on these trends to make advanced technologies possible; we’re at a really exciting turning point where we can drastically change and improve the way we work and shatter the conventional ways of doing things. Martin Stephenson, VP of Process Automation, Canada, Schneider Electric. Martin Stephenson, Vice President of Process Automation, Canada, Schneider Electric: The Industrial Revolution, otherwise known as Industry 1.0, started in the late 1700’s, which introduced mechanical production with the assistance of water and steam. Industry 4.0 is the latest transformation within automation and industry, built around the ethos of using cyber-physical systems, which can monitor and augment existing processes, in just about all manufacturing processes, across all segments. These cyber-physical systems are typically connected using an “Internet of Things” mentality, allowing a fast and accurate flow of information back and forth, enabling the end user to make real time, decentralized decisions about the production capabilities of his or her manufacturing facility, thereby creating a connected and digitized “smart plant”. What is the difference between Industry 4.0 and lean manufacturing? Martin Stephenson: Lean manufacturing is a generic term that suggests an ongoing process of using models to identify wasteful practices, reduce costs, and increase overall quality specific to the manufacturing area of a site. Industry 4.0 could be a subset of a lean manufacturing approach, whereby the end client would use a connected asset approach in certain areas of a plant’s production. What is the difference between Industry 4.0 and the Internet of Things? Jennifer Rideout, Manufacturing Subject Matter Expert, Cisco Canada: The Internet of Things (IoT) is the connection of people, processes, data and things over an IT network. For businesses, the IoT is at the centre of the merger of Information Technology (IT) and Operational Technology (OT) as data is collected to gain insights, optimize processes and create opportunities. Enabling this connectivity of machines and equipment on the factory floor is one element of Industry 4.0, so the IoT is a component of Industry 4.0. What is the difference between Industry 4.0 and the IIoT? Jennifer Rideout: The Industrial Internet of Things (IIoT) is the extension of the Internet of Things (IoT) into industrial environments. These environments require specialized products and solutions that have been ‘ruggedized’ to operate in extreme situations. They also typically require customization as many legacy technologies, such as controllers, still run on disparate communication protocols. IIoT solutions are part of the cyber-physical technologies that define the 4th Industrial Revolution, which encompasses additional solutions such as additive manufacturing, digitizing business processes, and advanced control systems. For manufacturers this translates to improved sustainability, less downtime, and more profitability across the factory floor. David McPhail, CEO, MEMEX: It depends on who is using the terms and what they mean by them. From MEMEX’s perspective, we usually refer to Data-Driven Manufacturing, as we feel it better describes the process. What matters to us is the business advantages that come when manufacturers automatically capture live machine data in real time and use that information as the basis of their decision-making processes. We want to see manufacturers get better and become more efficient. We want businesses to improve their processes and make better use of their physical and human resources. We want to know that we’ve helped businesses save time and money, and have given them the opportunity to redirect those assets into developing new innovations. Now, Data-Driven Manufacturing is available and accessible to manufacturers of all types and sizes, from the smallest shops to the largest plants. It is simpler to implement, scalable and affordable. That’s the message we want to spread, and whatever terms are used – IoT, IIoT, Industry 4.0 or Data-Driven Manufacturing — we support and encourage the conversation. What is the difference between Industries 4.0 and 3.0? David McPhail: The main differences between factories of the past — even automated ones — and the most technologically advanced factories of today is the concept of connectivity. In a Data-Driven Manufacturing environment, every piece of equipment and every industrial machine is transformed into a node on the corporate network. On a more granular level, Data-Driven Manufacturing enables real-time machine-level monitoring, giving manufacturers a previously unavailable view of machine health. It also enables manufacturers to become proactive in terms of their machine upkeep and repairs, reducing downtime due to mechanical failures and problems. How does Industry 4.0 ‘work’? Matt Rendall: Industry 4.0 is made up of advanced technologies, so the solutions are flexible and intelligent and fully autonomous. Automation isn’t new for the manufacturing industry, but it’s at a point now where it is beginning to transform the way factories operate. Since automation was introduced into factories, it’s made it cheaper and faster to produce a wide variety of products and that’s about to climb exponentially. Automation can span across the entire manufacturing plant and appear in a variety of forms from loading, unloading, kitting, inspection, quality assurance, and more. For example, a self-driving vehicle used for material handling can be integrated into the facilities’ ERP system, which calls it to the loading dock automatically. Once materials are loaded on the vehicle, it is assigned a work order (through the ERP) and moves the material to the next destination. It does not use any infrastructure and dynamically moves through the facility to the destination point, taking the most direct route. It uses a combination of lidar sensors and artificial intelligence to ensure it arrives safely and avoids all obstacles on the way. Advanced capabilities are just starting to enter the industry, which – when incorporated into plants – will allow machines to identify defects on their own and course-correct mid cycle. Similarly, predictive analytics are beginning to branch into factories; they’ll make predictions about unknown events in the process or facility by using data mining, machine learning, and artificial intelligence to analyze current data. These are some of the ways of how Industry 4.0 can work, but there are countless others. To date, the technologies have really been developed in a silo so we can expect to see that even more benefits arise as the technologies begin to work with one and other – the relationship between the technology provider and the industry integrator will be paramount to this. How do I implement Industry 4.0? David McPhail: Connectivity is the key to any Data-Driven Manufacturing implementation. This means companies must find a way to get every machine talking to the corporate network, and to do so securely, using standards-based technology. The simplest place to start is to utilize the MTConnect protocol, which is used by most modern pieces of industrial equipment. MTConnect is an open, standards-based, communications protocol. Any machine that runs MTConnect can simply and easily transmit real-time details about its status and health over any network, and the information will be immediately understood by any other standards-based system. Some older machines — the legacy equipment that often forms the backbone of a manufacturing operation — may not have a network interface, lacking either a serial port or an Ethernet connection. These pieces will need industrial-strength edge hardware attachments to act as webservers and transmit the harvested machine data (either wirelessly or via Ethernet) to the corporate network. Once attached, these devices translate the machine’s native language into standardized MTConnect data, and pass the collected information along the network. In addition to the connectivity pieces, your Data-Driven Manufacturing implementation needs a software platform to manage all of the automatically collected machine data, and it must be secure. At MEMEX, we know how vital good security practices are. That’s why we partnered with Cisco and Mazak on the SmartBox — a Cisco Industrial Ethernet 4000 Series Switch which adds MTConnect, MEMEX’s MERLIN software platform and Mazak’s SMOOTH process-performance technology. Does Industry 4.0 help my business? How? Jennifer Rideout: Industry 4.0 solutions improve the efficiency, quality, and utilization of factory operations. The Business Development Bank of Canada released a report in June 2017 that showed 60% of Canadian manufacturers who adopted Industry 4.0 solutions experienced a boost in factory productivity. Nearly 50% reduced operating costs, and 42% improved product quality. Simply put, Industry 4.0 helps manufacturers make more, in less time, for fewer resources. Related: Are Canadian manufacturers ready for Industry 4.0? Sadly, the answer is no. Industry 4.0 solutions improve the efficiency, quality, and utilization of factory operations. Why should I implement Industry 4.0 solutions? Matt Rendall: The manufacturing industry has always focused on building out lean processes. Consumers want things faster, cheaper, and expect better quality than ever before. So, it keeps operators on their toes leaving them to ask: how do I build a product with the highest throughput, lowest cost, least amount of material and fastest cycle time? And once manufacturers crack the code on creating a lean process, they challenge themselves to push further through continuous improvement. The problem, however, is that continuous improvement has become status quo because everyone is doing it. If you want a competitive advantage, you need to do more than what everyone else is doing. When we talk about why it’s important to embrace change and technology, it’s in acknowledgement that everyone is pursuing continuous improvement and that status quo is simply not good enough. This reason alone should be reason enough to implement Industry 4.0 solutions – the resulting benefits will move operations into an entirely new playing field. It’s also worth noting that Industry 4.0 can be implemented in phases and doesn’t have to be done all at once. Implementation is a process that includes multiple stakeholders and step gates. Here’s a great example of how to prepare for Industry 4.0. How much does it cost to implement an Industry 4.0 solution? David McPhail: Costs, of course, depend on a variety of factors including the number of machines to connect, the addition of hardware components to enable connectivity, and the price of associated software licensing. The price of Data-Driven Manufacturing has dropped significantly in recent years. Plants can install it on just one critical piece of equipment, on a handful of machines, or on every tooling station on the shop floor. This versatility means manufacturers can focus their technology budgets on the tools that have the biggest impact on their business. Solutions can start at anywhere between $2,000 and $8,000 per machine. When this price is paired with the possibility of only doing a small (one or two-machine) installation, it becomes readily apparent that Data-Driven Manufacturing is well within reach of everybody. Industry 4.0 is the latest transformation within automation and industry, built around the ethos of using cyber-physical systems, which can monitor and augment existing processes, in just about all manufacturing processes, across all segments. What are the risks of an Industry 4.0 solution? How is data managed at this moment in time? Can the end user manage the velocity, variety, volume and veracity of its current information flow? What would happen if this was tripled or quadrupled? Cybersecurity is a key concern, and there is a strong need for any connected vision of the future to be designed, implemented and managed by unified IT and OT resources. Corporate culture is also a key factor in the success or failure of implementing Industry 4.0. Be sure that senior management understand both the clear benefits of a smart plant of the future, but also the potential pitfalls. They must be brought into the ethos of Industry 4.0 and be a major part of the decision making, to ensure absolute “buy in” from day one. One final point to consider: no doubt your main competitors are looking to Industry 4.0 to achieve maximum efficiency and profitability. The biggest risk to your company is not doing anything at all! Start small, with a top-down approach, involve all lines of business and engage partners you can trust and you will succeed at moving your business towards Industry 4.0. My sincere thanks to Matt, Martin, and David for providing their insights for this post. Cyber-physical systems are dramatically changing the manufacturing industry. MEMEX Inc., a Canadian software and hardware provider, is helping making the factory of the future a reality for manufacturers around the world. In part two of our conversation with David McPhail, CEO of MEMEX, we talk about how to simplify the Industrial Internet of Things (IIoT), the results MEMEX customers are experiencing with IIoT solutions and his advice for Canadian manufacturers. Read part one of our conversation here. Jennifer Rideout: The Industrial Internet of Things (IIoT) is still a confusing subject for many manufacturers. What are your thoughts on the IIoT and how do you explain the concept to your customers? David McPhail, CEO, MEMEX: We recognized long ago that in order for our customers to understand and benefit from the adoption of IIoT technology and the associated business outcomes, we had to boil the perceived complexity of IIoT down to a few digestible pieces. For the promise of IIoT to be real, there must be data. This data must be collected securely from all manufacturing assets, regardless of their type and age, utilizing a robust and secure connectivity layer consisting of either machine side hardware devices or available software protocols such as MTConnect or OPC. This data is collected in real-time and easily displayed and reported to the entire operational management team. The use of this data must lead to tangible business outcomes, with a repeatable and demonstrable value equation or ROI. In our case, MERLIN calculates Overall Equipment Effectiveness (OEE), the most important efficiency metric in manufacturing today. JR: I’d like to make the IIoT real for our readers. Give me a few examples of how your customers are using MERLIN to produce tangible, measurable business outcomes. DM: Mazak is one of the best example that comes to mind. Together with adopting MERLIN, Mazak deployed a series of 60-inch display monitors across their plant to establish a visual performance benchmark, and related training protocols, that could easily expand across their massive machine tool manufacturing plant. For the first time, Mazak’s top management and operational teams had access to actionable reports. This led to a host of immediate valuable improvements. Their adoption of MERLIN afforded them a 42% productivity increase within the first six months, along with reducing operator overtime by 100 hours/month. Another benefit was the return of 400 hours/month of previously outsourced work. This project also resulted in the development of SmartBox, a platform that allows for an easy and secure entrance into the IIoT for manufacturers. JR: Thanks for your time David, I have one last question. What advice do you have for manufacturers who want to adopt IIoT solutions, but aren’t sure where to start (or how)? DM: In any decision where there is new ground to be broken, such as the adoption of IIoT-centric technology in manufacturing, the first questions should be WHY? Unfortunately too many companies focus on the HOW first, and that is where the confusion starts, in my opinion. When a company ignores the “why should we do this” question in favor of the “how do we do this” question, the anticipated IIoT-centric business outcome has been relegated to the second-most important piece of information. The HOW is where all the technical issues are addressed. These can include both technical specification-type details, as well as internal change management-type issues that, although important in their own right, unfortunately do not assist the decision maker in determining the net effect that an IIoT project can have on the company’s bottom line. The WHY is the first question that should be answered, as this will accurately paint the picture of the anticipated investment in IIoT (the risk), as well as the anticipated business outcome (the reward). Only once this piece of important information, the business outcome (the WHY), is understood by decision makers, and the project “greenlighted,” is the HOW relevant. We have many case studies of manufacturers that have blazed the IIoT trail for others to follow. The number one item to be learned from their IIoT implementation is the actual ROI received for the efforts expended. My advice: start with the ROI value and timeline and determine if the project cost (the investment) is worth the price of success. The manufacturing industry is undergoing a significant shift in how products are made. Cyber-physical systems, made possible by the introduction of a secure IT network to the shop floor, are creating new ways for manufacturers to monitor, analyze and automate processes. The result? Manufacturers are spending less money, while making more, on the factory floor. At the heart of these cyber-physical systems is MEMEX, a Canadian software and hardware provider based in Burlington, ON. I sat down recently with David McPhail, CEO of MEMEX, to discuss the Industrial Internet of Things (IIoT), MEMEX’s latest solution and his advice for Canadian manufacturers. Part one of our conversation is below. Watch this space for part two in the coming days. Jennifer Rideout: For readers not familiar with MEMEX, describe your company for us. David McPhail, CEO, MEMEX: Established in 1992, MEMEX was founded with a vision to improve the way automated machine and production equipment work and connect on the factory floor. Since then MEMEX has proved itself a pioneer in IIoT time and again. With a comprehensive understanding of the manufacturing industry, we are the global leader in machine to machine connectivity solutions. We have been on the leading-edge of the convergence of industrial trends in Computing Power, Connectivity of Machines, Industry Standards, Advance Software Technology and Manufacturing Domain Expertise. Encouraged by the rapid adoption and success of MERLIN, we relentlessly pursue the development of increasingly innovative solutions suitable for the IIoT era. Our company envisions converting every machine into a node on the corporate network, creating visibility from shop-floor-to-top-floor. JR: Tell me more about your solution, MERLIN. What value does it offer manufacturers? DM: MEMEX’s software and hardware IIoT solution enable customers to achieve tangible IIoT-centric business outcomes. Our MERLIN software suite and connectivity products has enabled manufacturers to achieve upwards of a 50% increase in productivity and a 20%-plus increase in profit, on average. Additionally customers have secured payback in less than four months, which equates to an Internal Rate of Return greater than 300 per cent. MERLIN provides manufacturing analytics that enable the effective execution of continuous improvement initiatives in real-time. This allows the entire plant operations to be Lean. Furthermore, MERLIN creates the opportunity for a dramatic increase in Overall Equipment Effectiveness (OEE) based on accurate real-time information collected over a communication network connecting all machines, old and new. MERLIN is the essential link that allows manufacturers to connect machines together in a cost-effective and secure fashion. And it does so while ensuring machines, either in a single plant or multiple plants, are consistently reporting performance data in real-time to all stakeholders – from the shop-floor to the top-floor. JR: On that note, you recently introduced a new product. How does that build on your existing solutions? DM: At IMTS 2016, we announced the launch of MERLIN Tempus™ and MERLIN Tempus Enterprise Edition (EE), the next generation of our award-winning MERLIN Manufacturing Execution System (MES). MERLIN Tempus offers a new generation of tools and a dynamic configurable web-enabled dashboard that provides a complete view of the shop floor. The Enterprise Edition offers complete OEE calculations and other critical metrics, along with a dynamic visual job scheduler. It also empowers customers to seamlessly incorporate future Smart Manufacturing technologies as a part of the overall MERLIN platform. We developed MERLIN Tempus as an extremely flexible out-of-the-box packaged platform/tool kit solution that is proven, comprehensive and complete with no custom programming required. Additionally, the system includes a robust reporting engine that offers an unlimited number of slice-and-dice data reports, automated report scheduling, and real-time machine alerts via email or SMS. This translates into fast, low-cost implementation, easy-to-understand OEE metrics, and a rapid ROI. Watch this space for part two of our conversation, where David will talk about how to simplify the IIoT for factory operators and share his advice for Canadian manufacturers. 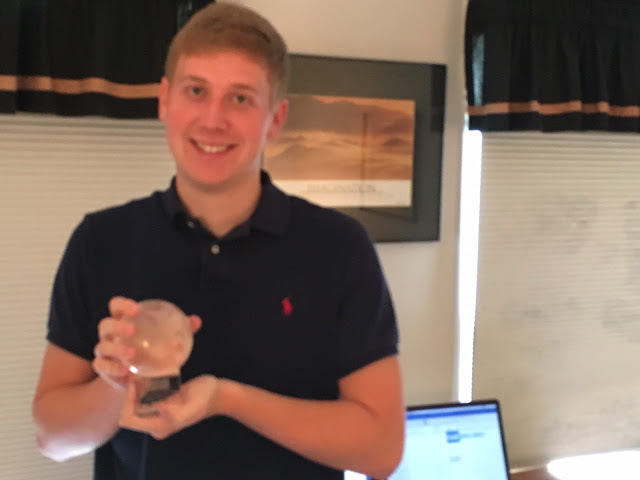 Outstanding Software Developer – Summer Internship at Memex Inc.
Today is Tim Edstrom’s last day as a summer intern for Memex Inc. Tim started for MEMEX the latter part of May in a 30 hours per week position as a software developer. Tim was up here the latter part of May to meet everyone and then worked remote. Tim is a very bright young developer who did an outstanding job working on a future software package for our MERLIN Manufacturing Executive System (MES) platform. The software package Tim worked on will be a first in the industry piece of software. Tim is finishing up his BS in Computer Science at James Madison University this year and will graduate in May of 2017. 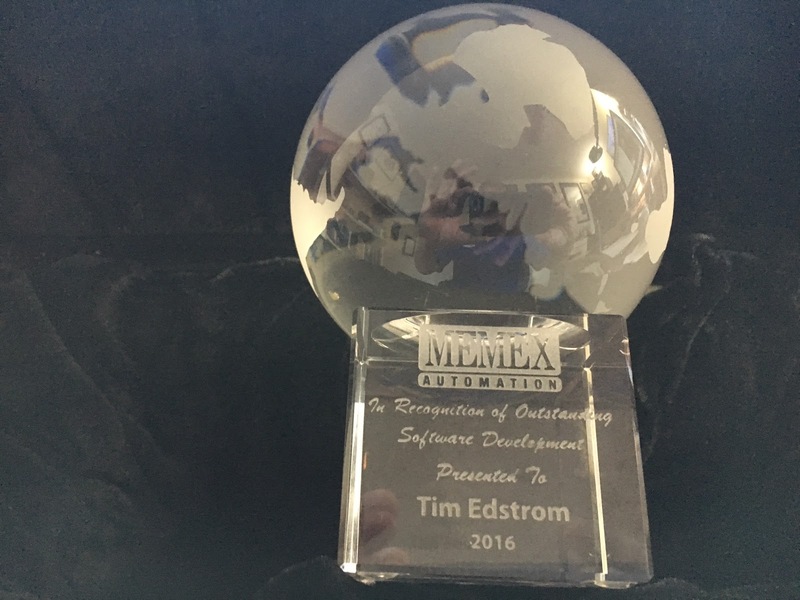 Huge thanks to Tim for doing a great job for MEMEX’s Software Development Group! 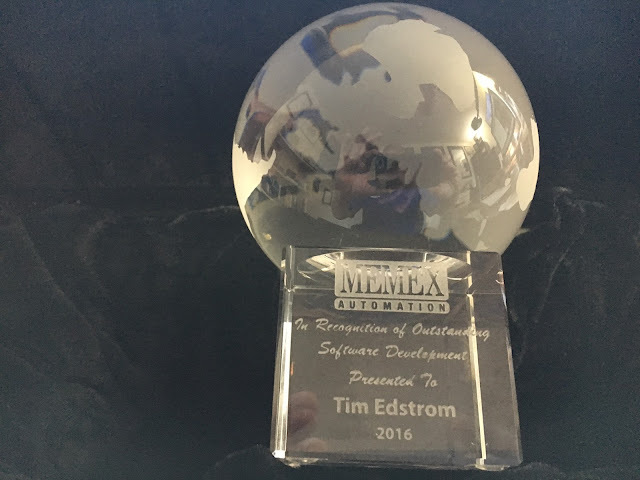 Below are a few photos of Tim in his remote office with the crystal globe that we had created to show a token of our appreciation, as well as the MEMEX Development group lunch that occurred when Tim was in the MEMEX office during his May visit. Above is the extremely talented Memex DEV Team. 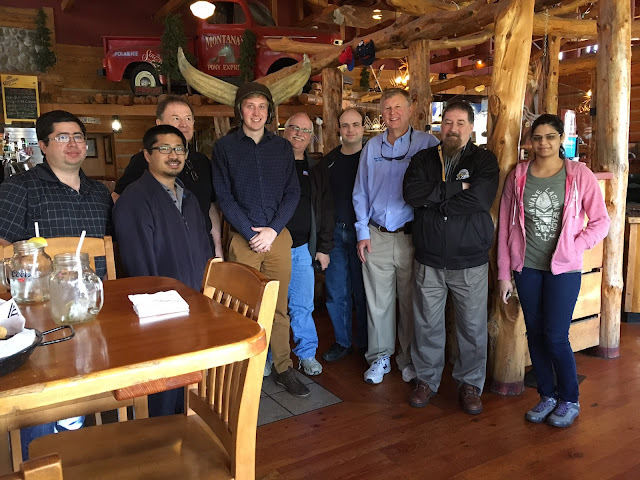 From left to right is Ryan, Brian, Doug, Tim, Tim S., Jeremy, Dave, Terry and Anusha (not pictured is Gowtham who was on vacation and Ken who is in Woodstock). Tim learned a great deal from the MEMEX DEV team. When I started on the shop foor, machine tools were dumb. Communication levels weren’t determined by protocols or baud rates but by which machinist could yell the loudest. NC programs were loaded from paper tape, tool offsets made with a hammer, and part quality results recorded on handwritten forms. What a change a few decades make. Today’s technology allows shops to monitor virtually every aspect of production, from what tools were changed yesterday to how many minutes the spindles sat idle last week to what jobs are running on which machines right now. So much has changed, in fact, that some say the next industrial revolution, or Industry 4.0, is upon us. One proponent of this revolution is David McPhail, president of industrial communications platform provider Memex Inc., in Burlington, ON, who counts Mazak Corp. among key global customers for the company’s flagship product, Merlin. McPhail points to data driven manufacturing and the Industrial Internet of Things (IIoT) as two examples of the technology companies can leverage to improve productivity and part quality, if only they have the will to overcome fear of the unknown. Those advantages are numerous. Lights out production, shorter lead times, improved tool life—the list goes on. One often-overlooked benefit of integrated machine communication is better part quality, says McPhail. Dave Edstrom, CTO of MEMEX Inc., explains the three “A”s of MTConnect in his blog. As the former President and Chairman of the Board of the MTConnect Institute, I have given this 10 minute presentation countless number of times to explain the Three “A”s of MTConnect – the Adapter, Agent and Application. As a reminder, MTConnect is the open, royalty-free manufacturing communications protocol which fosters greater interoperability between manufacturing devices and software. The MTConnect standard provides connectivity and the capability to monitor and then harvest data from the entire production floor: machines, cells, devices, and processes. The standard makes this possible, because it’s based on XML and HTTP Internet technology for real-time data sharing. The adapter is the piece of software and/or hardware that sits between the device itself, such as a machine tool, sensor, compressor, any MTConnect enabled device, and the agent. The adapter needs to speak the specific language that the device understands and then convert that to SHDR (Simple Hierarchical Data Representation – a simple time stamped human readable stream separated by “|” symbols as delimiters. The information is sent continuously from the device to the adapter and then to the agent. Please note that the SHDR protocol is not officially part of the MTConnect spec, but in reality, almost all of the adapters use SHDR to speak to the reference agent. The reference agent is the agent that is out at http://github.com/MTConnect that almost all of the implementations out there today use as their agent. The agent can be thought of as a simple web server that on one side talks to the adapter and the other side talks to applications. The agent is what translates the SHDR and makes it available in MTConnect (XML) format via http (how you access any webpage on the web today such as ESPN.com). The agent responds to simple commands from the apps or applications such as probe, current, sample or asset as examples. The agent has a circular buffer for storing the data that is coming from the adapter. Typically this is about 10 minutes of data. The app or applications can be anything that wants to get information from the agent on what the MTConnect enabled device is doing. Typically, the app is a shop floor monitoring app such as MERLIN. Apps query the agent and typically store that information into a database as well as make that info available in dashboards, reports, email alerts and countless other ways. I think these 10 minutes should give you a very nice overview of how MTConnect works and a deeper dive on what happens under the covers for MTConnect with the Adapter, Agent and Application. To view Dave Edstrom’s blog, please click here. On Tuesday April 21, 2015, we were able to thank and recognize or software developer co-op student at Memex Automation, Gaurav Chaudhari, from the University of Waterloo. Gaurav is very bright and a gifted software developer who worked for us this past winter in a full time co-op position as a software developer. In the months that Gaurav was with the Memex Software Development Team, he managed to work on a number of important projects for us. Gaurav helped create and develop software for our future MERLIN 3.0 Manufacturing Execution System (MES) platform in a number of areas, including the auto report scheduler, dashboard utilities, visual job queue, slide show and job editor. We want to thank Gaurav for his outstanding work and we wish him all the best! Gaurav, with his special Memex Automation memento, for all the hard work he put in. The Development Team took Gaurav out to a celebratory lunch. Looks like they had a great time! Memex /wp-content/uploads/logo.png Memex2015-04-22 09:00:542015-04-22 09:00:54Thank you Gaurav! Dave Edstrom, CTO Memex Automation, blogs about the good news of Cisco joining MTConnect as a technical advisor. This is GREAT news for MTConnect and the world of manufacturing! Note: I received permission from Cisco to both use their logo and and to state Cisco joined MTConnect. Cisco’s Bryce Barnes is also presenting at [MC]2 2015 and below is from the MTConnect Conference web page.